After setting a new competition record in the 800 freestyle on the first day of the Spanish Open in Las Palma Mireia Belmonte set her second meet record on Saturday evening posting a 4:36.89 in the women’s 400 IM. Belmonte, who won the Olympic silver medal in this event in London, was well off her season’s best of 4:33.42 that she put up in March. She has now won three events at the Open taking the 800 freestyle and 200 butterfly on the first two days of the competition. Belmonte was not the only one to set meet records on Saturday evening. 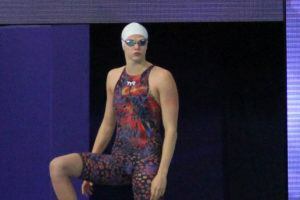 Her Olympic teammate Melani Costa won the women’s 200 freestyle in a new competition record time of 1:57.78. Costa beat her season’s best of 1:58.08, which she put up at the European Championships. Miguel Duran also set a new meet record in the men’s 800 freestyle taking the event in a time of 7:58.49. After the Real Canoe NC women’s 4 x 200 freestyle relay team set a new competition record on Friday evening the men’s 4 x 100 freestyle relay team matched their accomplishment setting a new meet mark on Saturday. The team posted a time of 3:20.36. This is an impressive result considering that they were only three seconds shy the Spanish record of 3:17.21, which was set by the European Games relay in May. Albert Puig won the men’s 200 freestyle in a time of 1:50.07 while Konrad Cerniak of Poland won the men’s 100 butterfly in a time of 52.31. Judit Ignacio took the women’s 100 butterfly finishing in a time of 1:00.39. 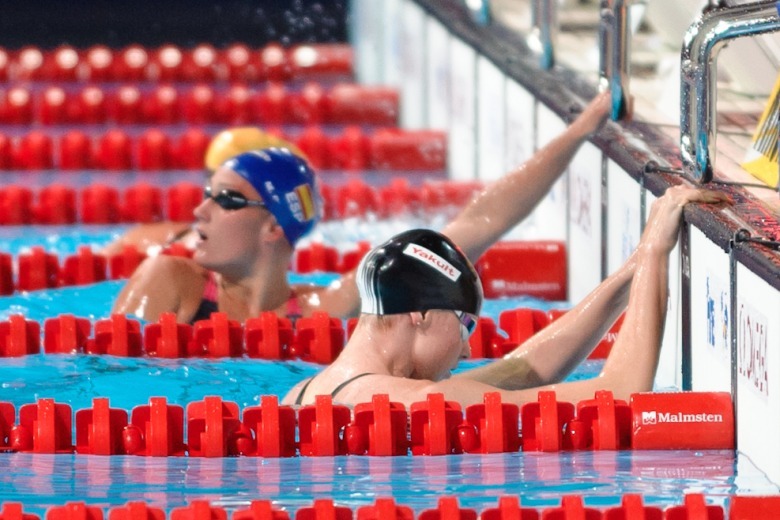 Titles in both the 50 breaststroke and 50 backstroke were up for grabs on Saturday evening. Bruno Ortiz won the men’s 50 breaststroke in a time of 28.32 while Jessica Vall took the women’s event in a time of 31.80. Juan Rando won his second event of the competition taking the men’s 50 backstroke in a time of 25.46 while Mercedes Peris took the women’s event in a time of 28.51. If there’s a swimmer who needs to drop an event or two to stay fresh for their better events, it’s Belmonte. She has great chances of winning the 200m Fly. But if she insists on going to the 400 free and 200IM instead of resting, she won’t stand a chance. Mireia deserves an olympic gold and the 200 fly is her only chance. I doubt it will happen after her injury but I’m rooting for her in that event.